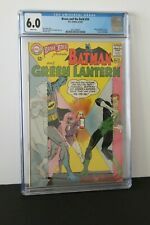 The Brave And The Bold 58 CGC 5.0 Cream To Off White Pages. The book will be WELL. Buy 2 CGC books and save 4%. Buy 3 CGC books and save 5%. Buy 4 CGC books and save 6%. protected tomaintain the condition of the book. 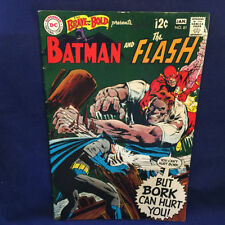 For sale is Brave and the Bold #85 in VF/NM condition. All photos are of the actual comic book(s) you will be receiving. Brave and The Bold #54 - CGC 6.5 FN+ - DC 1964 - 1st App & ORIGIN Teen Titans! 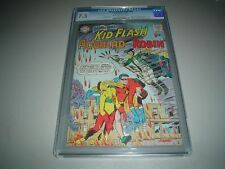 1st Appearance and ORIGIN of The Teen Titans (Robin, Aqualad and Kid Flash)! Batman, Flash and Aquaman Appearance! Beautiful CGC 6.5 (FN ) example - Cream to Off-WhitePages with Excellent Gloss quality! Grade: CGC 8.5. Published 1966 by DC. Cover pencils by Mike Sekowsky, inks by Joe Giella. Ad for Batman and Robin Magic Photo Kit. 36 pgs., full color. We buy tens of thousands of comics a month. We buy everything from large collections and estates to individual high value Golden Age and Silver Age books and everything in between. Grade: CGC 7.0. Published 1965 by DC. Cover by Murphy Anderson. "The Big Super-Hero Hunt!". Text page describes the origins of Wildcat, the Huntress, and Sportsmaster. 36 pgs., full color. We buy tens of thousands of comics a month. Cover by Bruno Premiani. 36 pgs., full color. Grade: GD- 1.8. Published 1964 by DC. This is a low grade item. The story will be complete and readable, butthe item itself will have major defects. We buy tens of thousands of comics a month. Brave and the Bold 54. Piece Missing From 1st Page - See 3rd Scan. No Flimsy Envelopes. Brave and the Bold. CGC 7.0 White Pages. 1961 DC Comics. 20 – Fine Plus condition. 23 page Teen Titans story "Titans Fit the Battle of Jericho" The superhero Joshua breaks into Teen Titans headquarters to get the Titans to help him stop a group of teen-agers who have been unwittingly tricked into helping aliens initiate "Operation Jericho". BRAVE AND THE BOLD #25 CGC 3.0 -- 1ST APP & ORIGIN SUICIDE SQUAD & RICK FLAG! 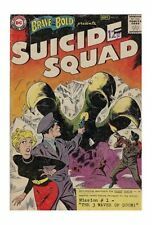 This issue contains the first appearance and origin of the Suicide Squad by Robert Kanigher with art by Ross Andru and Mike Esposito. Brave and the Bold #25 CGC graded in 3.0 condition! Grade: CGC 1.5. Published 1960 by DC. Cover by pencils Mike Sekowsky, inks by Murphy Anderson. It's Fun to Help Others! Starro vs. Green Lantern, script by Gardner Fox, pencils by Mike Sekowsky, inks by Joe Giella; One of Starro's lieutenants steals and explodes an atomic bomb to absorb its power. Up for sale is Brave and the Bold #64 CGC graded at 8.0. If you have any questions feel free to message us. If you are in the Oklahoma City area or traveling through, come in and see us. A very nice middle-grade copy of this key issue! BRAVE AND THE BOLD #34 (DC Comics, 2-3/1961)-1st Silver Age Appearance of Hawkman and Hawkgirl. CGC 3.0 (GOOD/VERY GOOD). CGC Label #1266801007. I appreciate everyone's understanding! We cannot will not respond to those inquiries. The comic pictured is a hi-res scan of the comic you will receive. Grade: CGC 3.5. Published 1960 by DC. Cover by Bruno Premiani. 36 pgs., full color. We buy tens of thousands of comics a month. We buy everything from large collections and estates to individual high value Golden Age and Silver Age books and everything in between. 1st appearance of the Justice League of America!! SILVER AGE KEY!! Nice copy - great to build around in any collection! Amazing Inventory of Gold, Silver and Bronze Comics and Original Art. See us at shows around the country! Feel free to call us M-F, 9-6 EST. Our grading is strict and professional. Brave and the Bold #79, 1968, DC. Early Deadman appearance with Neal Adams art and cover. Clean, tight, flat. Upper right corner has lightest corner crease marks that barely break color. All attached well at staples. Cover by Bruno Premiani. 36 pgs., full color. Grade: CGC 9.0. Published 1964 by DC. We buy tens of thousands of comics a month. We buy everything from large modern collections to individual high value Golden Age and Silver Age books and everything in between. Grade: GD 2.5. Cover by Nick Cardy. Superman ad. 36 pgs., full color. Published 1965 by DC. This is a low grade item. It will be complete and readable, but will show significant wear. We buy tens of thousands of comics a month. Brave and The Bold #28 DC 1960. Beautiful 1.0 (FA) example - Cream to Off-White Pages with Great gloss quality! "Justice League". -Lies flat. The Brave and the Bold #36 (DC - 6/1961) HIGHER GRADE VF 3rd SA HAWKMAN! FIRST PRINTING. 3rd SILVER AGE appearance of HAWKMAN - early SILVER AGE DC BOOK; 10 cent cover price hard to find in higher grades! THIS BOOK HAS BEEN CHECKED; NO RESTORATION HAS BEEN FOUND. BOTH STAPLES are CLEAN, RUST FREE & SECURELY ATTACHED. Origin and first appearance of the Silver Age Hawkman, Hawkgirl and Blyth by Joe Kubert. BRAVE AND THE BOLD #34. For most that have collected comic books for the last 30 years, you have probably heard of us. Comics average Fine(6.0) condition. There are 8 issues in this lot. Run Box # 717. Brave Bold #29 & #30 (1960) - low grade readers. #29 - Poor to Fair. Date stamp, 1.5" tear FC, spine flattened, book a little stiff. #30 - In the Fair range. Grade: CGC 0.5. Published 1960 by DC. Cover by pencils Mike Sekowsky, inks by Murphy Anderson. It's Fun to Help Others! Starro vs. Green Lantern, script by Gardner Fox, pencils by Mike Sekowsky, inks by Joe Giella; One of Starro's lieutenants steals and explodes an atomic bomb to absorb its power. Boxed and well cushioned with bubble wrap. 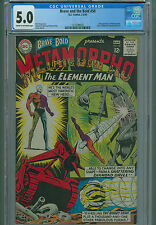 CGC/CBCS graded cases are in excellent condition unless otherwise noted. Cases may have minor scuffs or other imperfections. CBCS cases may have marks in the side of the case. Those marks arise when the case was broken off the mold and are normal. Cover by pencils Mike Sekowsky, inks by Murphy Anderson. 36 pgs., full color. Published 1960 by DC. This is a low grade item. The story will be complete and readable, butthe item itself will have major defects. HERE IS YOUR CHANCE TO GET A COPY OF BRAVE AND THE BOLD # 31, FROM AUGUST/ SEPTEMBER 1960. THIS BOOK FEATURES THE 1ST APPEARANCE OF CAVE CARSON, THE 1ST TRY-OUT SERIES. IT ALSO FEATURES AN AD FOR WORLD REFUGEE PROGRAM WITH SUPERMAN.